city’s history and explore one of Italy’s most important archaeological areas. Opening Period : Euterpe L.H.T. 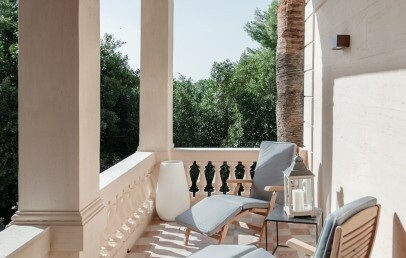 Just a few paces from the Agrigento Station, Euterpe is situated in Viale della Vittoria, an elegant city belvedere from whose terraces you can get a fine view of the Valley of the Temples and the whole coast. Just a short walk will bring you to the historic city centre with its numerous bars and restaurants. 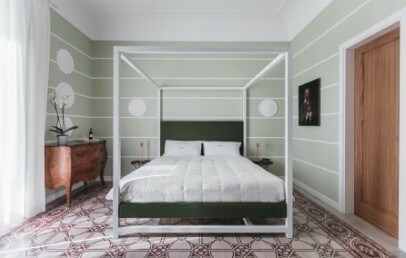 A stylish alternative to a hotel stay, Euterpe L.H.T. offers all the hospitality and peace and quiet of a private residence plus 5-star hotel services. 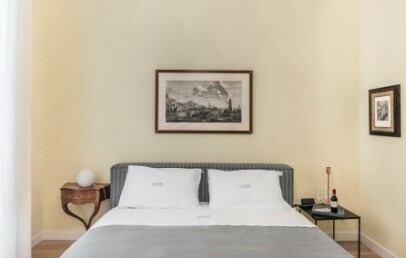 This superb B&B occupies the first floor of a stylish old noble palazzo dating back to the early 20th century, a family home and art gallery, built to host the paintings of verist artist Francesco Lojacono, one of the great Italian landscape painters of the 19th century. 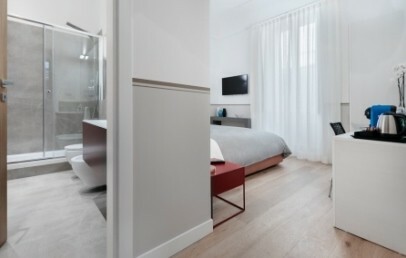 Welcoming and stylish, the five rooms on offer are a blend of classic elements and contemporary design. 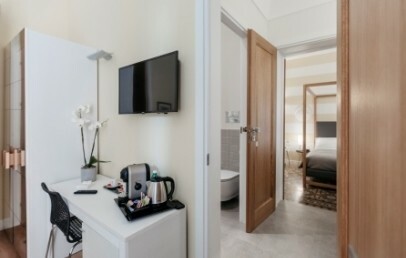 All rooms have Wi-Fi connection, Smart TV, independent heating and air-conditioning, wardrobe, desk, small safe, mini-bar, espresso coffee maker and kettle. 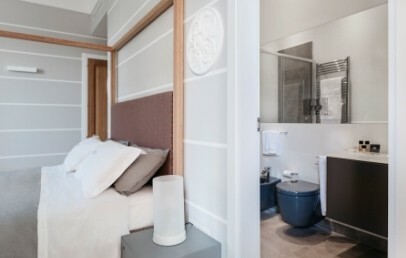 Each room has a large heated bathroom, with large shower, hairdryer and courtesy toiletries. Each room has moreover a Book Room (available in Italian and English), this is an electronic city guide with tips what to see, where to eat, where to go on the beach and so much more. 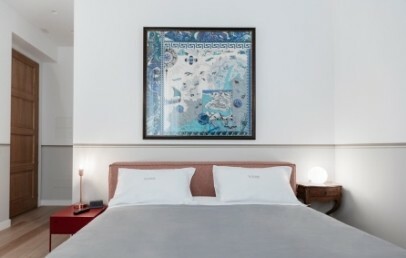 Room price includes Wi-Fi connection and a wide-choice breakfast, served in the fine hall. The staff is able to suggest tours and excursions and direct you to the best restaurants and bars in the city. With payment of a supplement, the small wine cellar of the residence offers a fine selection of local and non-local wines. The services of an expert multi-lingual guide are available on request. 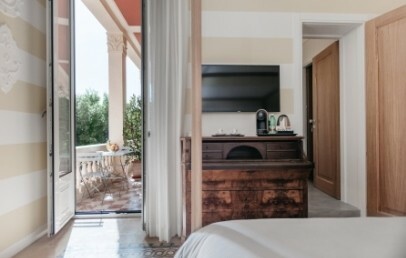 Euterpe offers a small wine cellar with about thirty regional labels, from which the guests can order one or more favorite wines in the room, with room service. City tax – Euro 1,00 per person, per overnight for the first 3 overnights, from the 4th overnight € 0,10 per person, per overnight. Valid for the entire summer season. It has to be paid on-site. 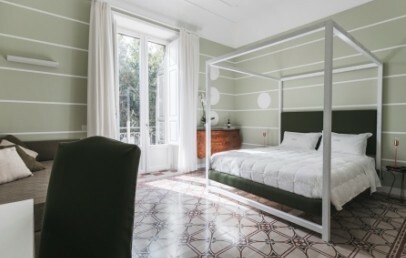 Original floor tiles and stylish decorations, Suite 1 has a balcony looking out over Viale della Vittoria and has a double bed with canopy and a sofa which can be converted into a second bed (100 cm wide). 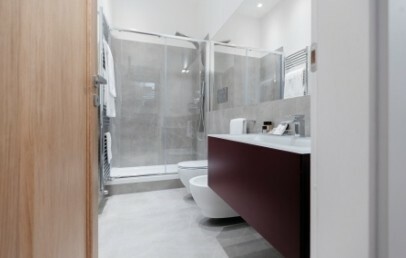 The heated bathroom has a large shower, hairdryer and set of courtesy toiletries. Suites 1 and 2 can be connected. Stylish and welcoming, Suite 2 has a fine canopied double bed of modern design and a sofa for use as a second bed (100 cm wide). 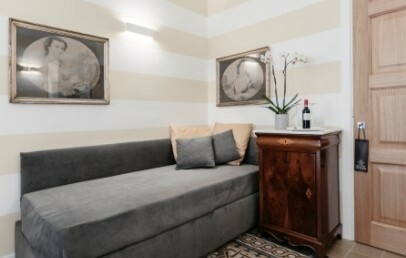 The room faces on to Viale della Vittoria and has a large terrace furnished with comfortable chairs. 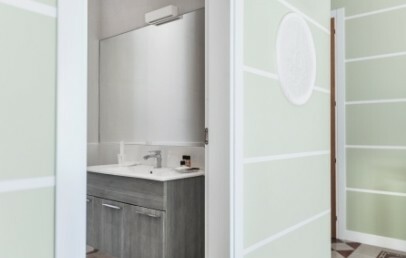 The heated bathroom has a large shower, hairdryer and set of courtesy toiletries. Suites 1 and 2 can be connected. 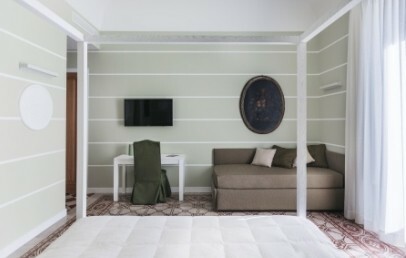 Classic style and soft colours, Room 3 is comfortable and relaxing, and also has a pleasant, furnished terrace. 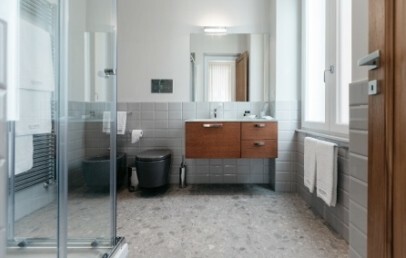 The heated bathroom has a large shower, hairdryer and set of courtesy toiletries. Suites 3 and 4 can be connected. 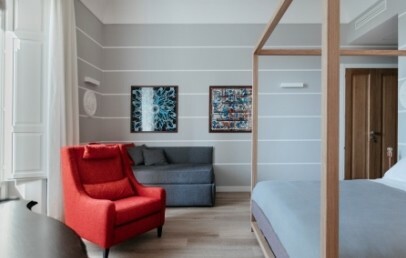 Stylish and welcoming, Suite 4 has a fine canopied double bed of modern design and a sofa for use as a second bed (100 cm wide). 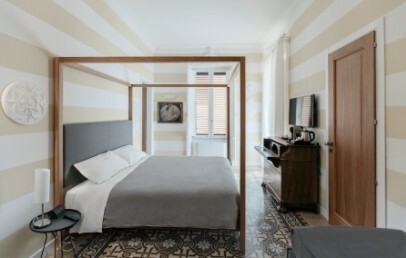 This room boasts a magnificent original tiled floor and has a light and airy furnished terrace. The heated bathroom has a large shower, hairdryer and set of courtesy toiletries. Suites 3 and 4 can be connected. 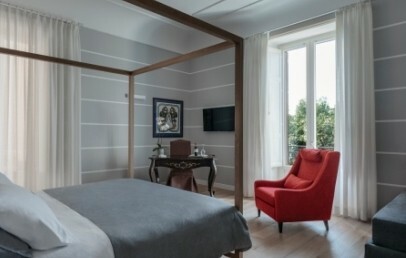 Stylish and welcoming, Room 5 is a blend of classic elements and contemporary design, and is lit by a large window. 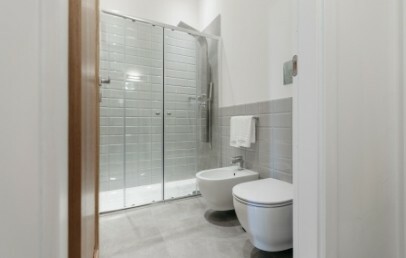 The heated bathroom has a large shower, hairdryer and set of courtesy toiletries. Exclusively for our customers: a bottle of wine (red, white or Prosecco) upon arrival; espresso machine and kettle with a selection of coffee, tes and herbal teas during the stay!